ADIOS SPOONS | Marbella Marbella – Adelante! As reported in the media on frequent occasions over the last year or so, the number of expats leaving Spain increases daily. Most have no wish to leave, but the Spanish government’s imbecilic policy of squeezing everyone for more taxes is having its effect, though not the one that was envisaged. Those with assets outside Spain have left in droves and whole villages have been decimated. The result being that the number of empadronados (registered residents) is reduced, thereby decreasing town halls’ incomes. Meanwhile countries like Ireland and Portugal do all they can to attract these same expats with imaginative tax concessions. Rose and Eddie left for the Algarve after ten years in Arroyo de la Miel. Unhappy at leaving Spain, but uncomfortable with a tax witch hunt, they wanted to experience for the last time what they considered to be one of Spain’s great gifts to civilisation – platos de cuchara. These ‘spoon dishes’, so called because they are eaten with a spoon, are rare in other countries where soup is the nearest substitute. 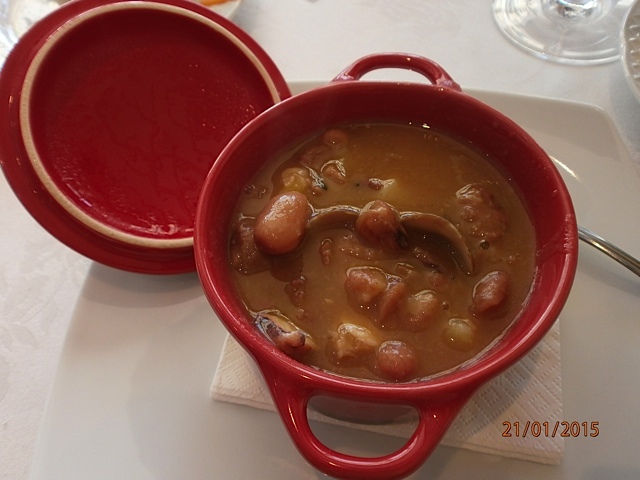 ‘Cuchara’ cuisine has reached magnificent heights and many people eat nothing else in the winter months. We went to La Espiga, an unpretentious neighbourhood-bar-like establishment near the town centre, whose owners, from León, specialise in cocido maragato. 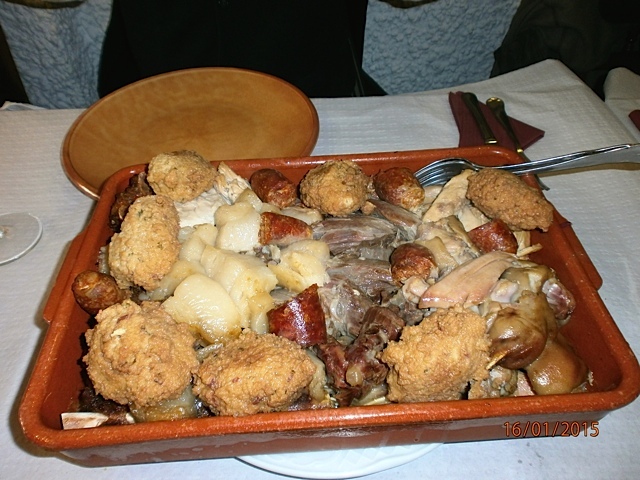 The usual Spanish cocido, often translated as a stew but is in fact much more, is cooked in a huge pot and served in separate courses starting with the broth and finally the meat. The maragato is back to front, meat first and soup last. None the worse for that and La Espiga’s version was noteworthy. Better to order in advance. 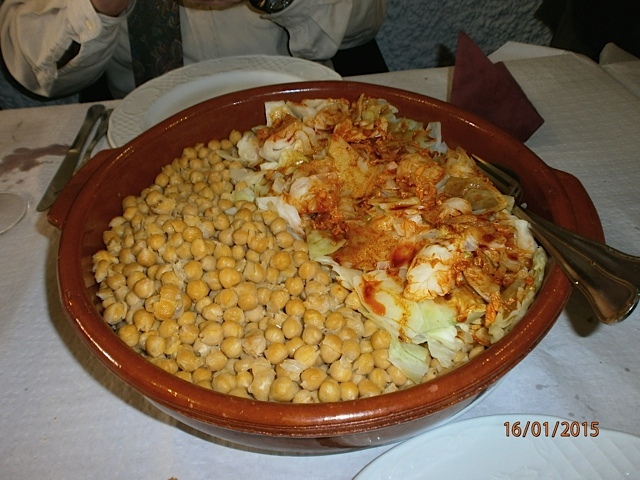 On to Alborada, notable for its bacalao, but on this occasion with a menu of 14 different dishes based on pulses and vegetables: potaje de garbanzos con bacalao y acelgas (chickpeas with salt cod and chard), garbanzos con manitas de cerdo estilo Axarquía, (chick peas with pigs’ trotters Axarquia-style, judiones de La Granja con perdiz de caza (white beans from La Granja with wild partridge), verdinas con chipirones y almejas (verdina beans with baby squid and clams) and pochas de Navarra con conejo de monte (pocha beans from Navarra with wild mountain rabbit). My friends departed happy and sad at the same time, while I was left thinking how lucky are we who remain here.